The Bulldawgs defeated Seneca High School, 5–0, last Tuesday to win the South Jersey Group II championship. 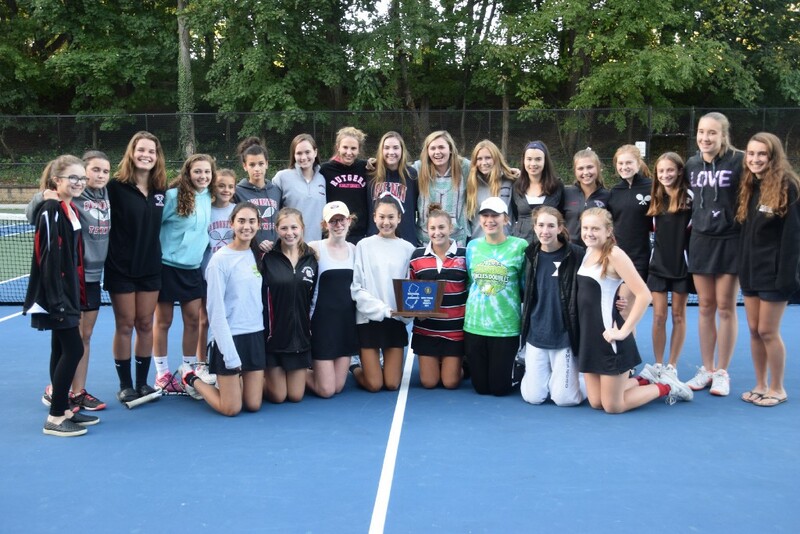 In recent years, sectional championships for the Haddonfield Memorial High School girls tennis team have become as synonymous with fall as Halloween and pumpkin pie. The Bulldawgs rolled to their 16th consecutive sectional championship last Tuesday, defeating Seneca High School, 5–0, in the South Jersey Group II championship. The sectional championship is the 37th in the program’s history. A number of factors have been key to Haddonfield’s success over the past 16 years. The biggest advantage the Bulldawgs have over opponents is their depth. Haddonfield has more than enough talent to fill all seven starting spots on varsity each year. The preseason is one of the most intense parts of the season as the players on the team play challenge matches against one another to fill the starting positions on varsity. The preseason challenge matches allow the players to be in peak shape when the season opens in September, even if some of the players are in new positions. Haddonfield had a lot of turnover in its starting lineup this year after losing two of its top three players from 2016 to graduation. Seniors Cassidy Cao and Rachel Rozenfeld played first doubles together in 2016. This year, both moved up to singles, with Cao playing second singles and Rozenfeld third singles. Both players had a lot of success in their new positions. Rozenfeld lost only two regular season matches in 2017 and was undefeated against South Jersey opponents. Cao lost only three times in the regular season, with only one loss coming against a South Jersey opponent. 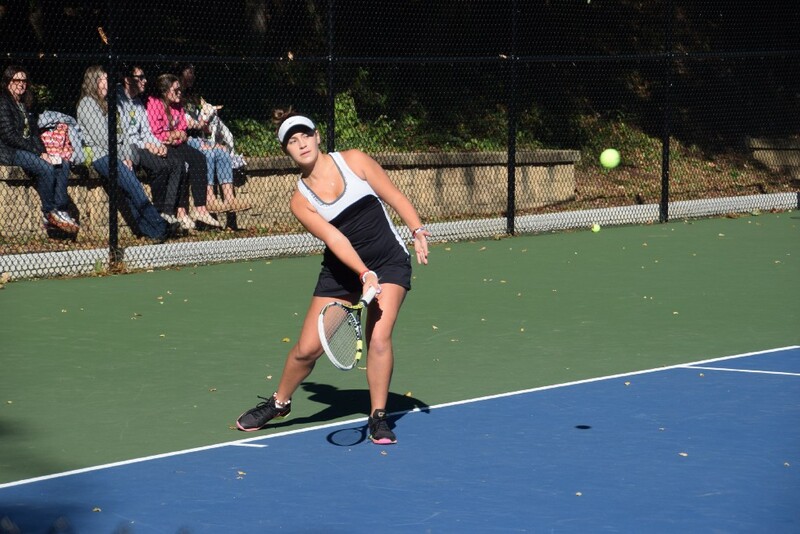 Providing a steady hand at the top of the Haddonfield lineup was Olivia Alberto, the team’s first singles player who finished her second straight season with a winning record despite taking on the opponent’s’ best player each match. 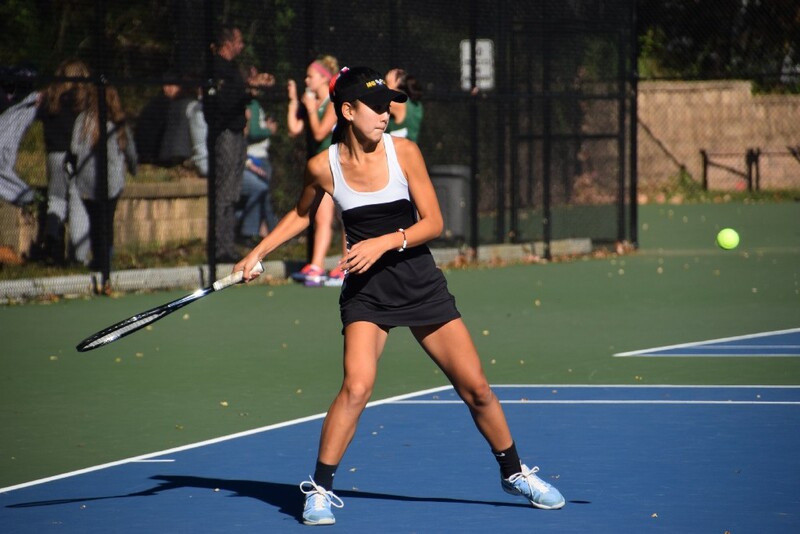 Haddonfield Memorial High School first singles player Olivia Alberto won 6–1 6–1 in her match in the South Jersey Group II championship. Alberto, Cao and Rozenfeld are also leaders off the court for Haddonfield. After the preseason ended, the three seniors made sure the players got past any challenge match disappointments and embraced their role on the team. “Even though we go from playing really competitive matches before the season to cheering each other on during each match, we get past beating each other and becoming one team,” Alberto said. Team unity is very important to the Bulldawgs’ winning ways. Rozenfeld said having her teammates cheering for her gave her a boost last week. With Rozenfeld engaged in a tough match against Seneca’s Rachel Tocci in last week’s sectional final, the entire team sat behind Rozenfeld’s end of the court to encourage her during a third-set match tiebreaker. Rozenfeld would prevail in the tiebreaker to win a marathon match lasting more than two hours. 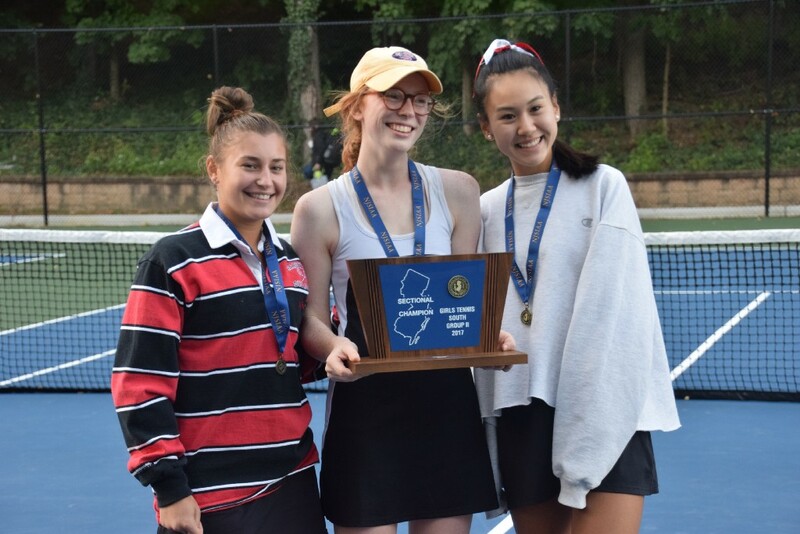 Haddonfield Memorial High School seniors Olivia Alberto, Rachel Rozenfeld and Cassidy Cao celebrate after helping the Bulldawgs win their 16th consecutive sectional title. Haddonfield plays a challenging schedule against North Jersey opponents to prepare for the postseason. The Bulldawgs annually appear in the Moorestown Classic tournament and also host the Haddonfield Invitational. Teams from North Jersey attend both events. Haddonfield will be put to the test on Thursday morning when it takes on West Essex High School in the NJSIAA Group II semifinals. If the Bulldawgs win, they play again that afternoon against either defending state champion Holmdel High School or Ramapo High School. Regardless of Thursday’s outcome, the seniors are proud they were able to continue Haddonfield’s sectional championship tradition for their entire high school careers and hope the Bulldawgs’ dynasty will continue for many years to come.